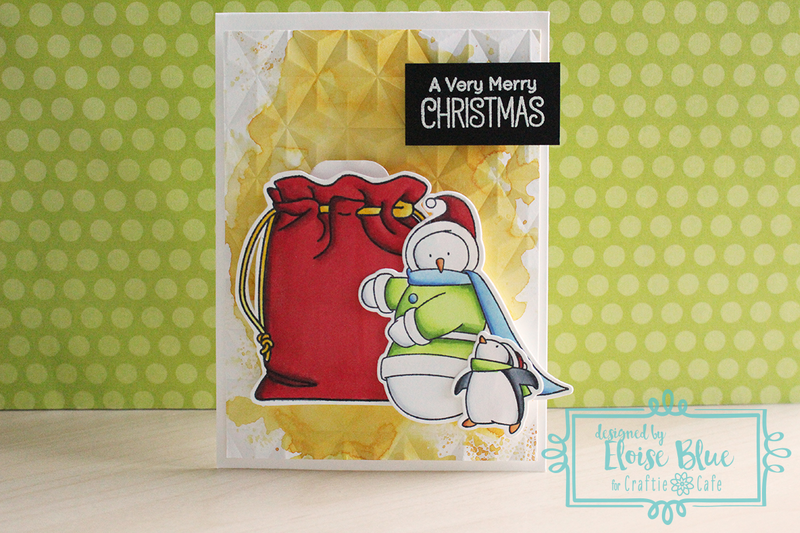 Hi everyone, today I have another project for Craftie Cafe and this month we are doing the theme Christmas in July – which is great because you can get a head start on Christmas cards and also, I love making Christmas cards so I’m so happy I get to make some now. To begin my card I first went ahead and stamped my images. I’m using the Special Delivery stamp set from Waffle Flower and also the Toasty Greetings stamp set from My Favorite Things. 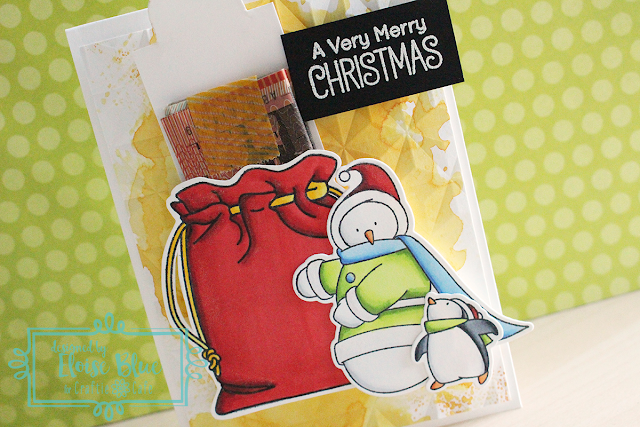 I stamped down the bag image, a snowman and penguin image and coloured them all in with Copic markers. I then used the coordinating dies for the Toasty Greetings images and then hand cut the bag image and placed them off to the side. I wanted to make my card interactive, originally I thought the bag image was wide enough for a gift card, but it wasn’t so I changed it up for a money holder. I cut a strip of white cardstock, long enough and wide enough to slide up and down my bag image. Once my piece was cut I then took a little bit off each side to create a pull tab also. I then folded up my bill, adhered it to the piece with washi tape and make sure that it slid fine. It did so I went ahead and put around three of the sides two layers of foam tape. Next up it was time to work on the background. I took a piece of watercolour cardstock and used some Spiced Marmalade and Fossilized Amber Distress Oxide Inks to do some ink smooshing. I pressed some ink down onto some acetate, spritzed it with water and pressed it down onto the watercolour paper. I did this a couple times for both colours and then heat set with my heat tool to dry faster. I then ran the piece through my Big Shot in a We R Memory Keepers embossing folder to give some texture. Now that my background and all my elements are ready. I first adhered down my bag, then my snowman and penguin to the right using some more foam tape. I then slid in my money slider piece and made sure it worked fine. 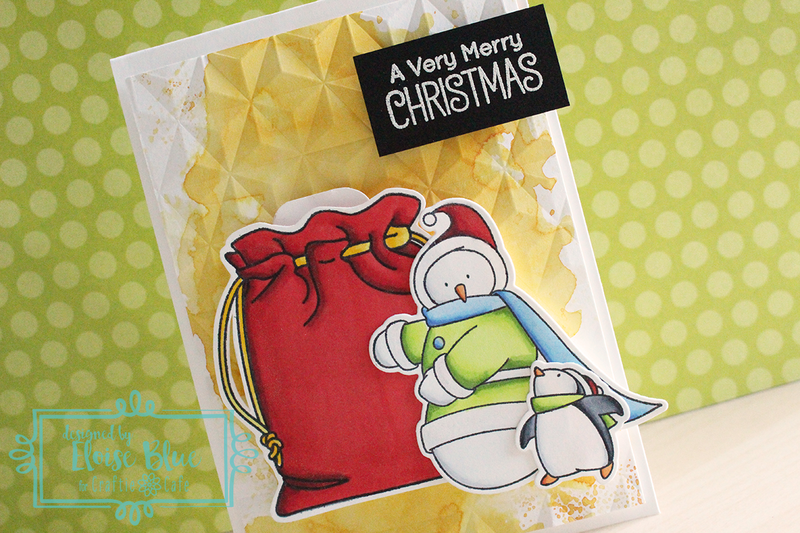 I then white heat embossed the ‘A Very Merry Christmas’ sentiment from Toasty Greetings onto some black cardstock and also adhered that to the right side of my card with foam tape. For a last finishing touch I added some Wink of Stella to my images and popped up the panel onto a white cardbase. I hope you enjoyed my card for today, I love interactive cards and I hope you do too!